FlameMasks FULL Tutorial : FlameMasks!, The Original :: Empowering YOUR creative Airbrush needs since 2001! BEFORE you apply the mask(s).....It is most important that you prep your car properly to start with!! Make sure it is clean, free of grease or oil and sanded well. Add primer coat as needed to fill minor scratches and defects in the casting, plus, this adds some adhesion to the overall paint job!! 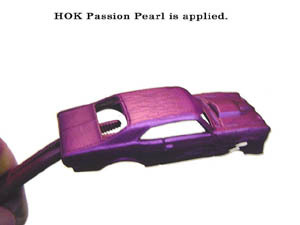 Failure to properly prepare the casting for paint will normally result in adhesion loss at some point of the mask operation. Well, the process is really quite simple!! 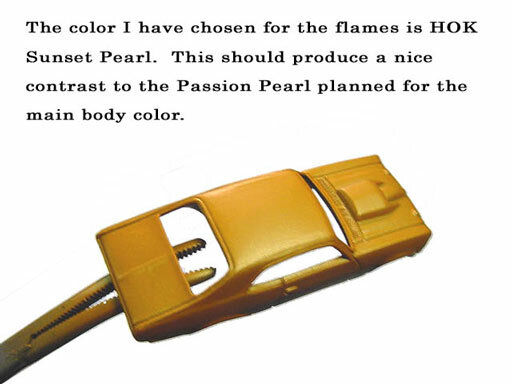 Will you be painting the color for the flames first? Will you be painting the color for the MAIN BODY first? this method requires the use of Inner Masks. To start, you will need to spray the color (or colors) for the flames in the area the masks will be applied and allow to dry thoroughly. You can either use one solid color for your flames or you can do a fade of multiple colors at this point. This is only limited to your imagination!! Some types of paint such as waterbased acrylics should have a light clear coat applied over the color BEFORE applying a mask, otherwise, some paint lifting could occur when the mask is removed...Please note what paint type you are using and if in doubt, its always wise to go ahead and shoot the light coat of clear on at this stage!! 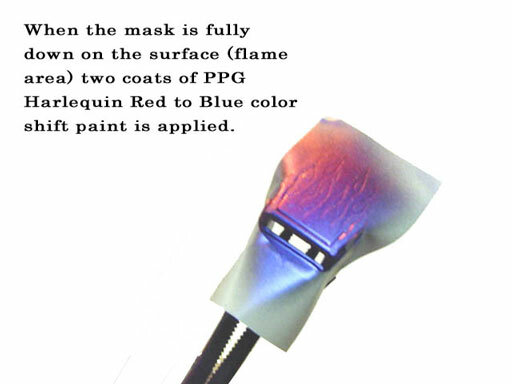 Once the paint has dried thoroughly, simply choose and apply an INNER Mask in the area you want your flames!! You can use one mask, or several or even cut just a few licks off another mask to add to your design!! Again, this is limited only by your imagination! If using Standard Sheet (Inner -OR- Outer masks, but, NO Application FILM), select a mask that suits your needs, and remove from sheet using a precision pair of tweezers or exacto blade. Use caution not to cut or damage the edge of the mask during removal and always start with the widest portion and peel back towards tips of flames for best results. Care must also be used when mask is removed not to let any of the licks cross each other as they will tend to get stuck to one another and can lead to severe damage. 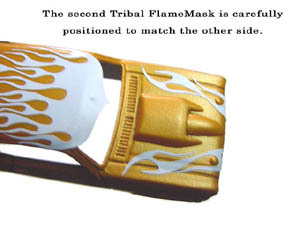 Once on the surface, you should inspect for touching or misaligned flame licks before pressing mask down. Any licks that need to be moved can be realigned with careful exacto blade manipulations. then its just a matter of choosing the mask or masks you desire and cutting it out of the sheet with a pair of scissors, much like you would do if using a decal. 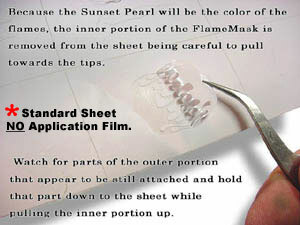 The application film can be a lot easier to use as it keeps all the flame licks constrained in their original positions during installation, thus, no worries of crossed or misaligned flame licks. 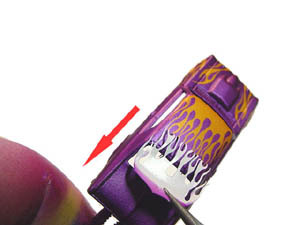 It also can make repositioning/aligning more reliable as long as the mask is not pressed down. I recommend new users begin with either inner or outer mask sheets WITH application film. Once you have the mask cut out, carefully separate the backing from the mask and film...the mask should be adhered to the film, however, if you notice a mask edge that is still on the backing when attempting to separate the layers, you should either stop, and place the mask on a flat hard surface and use a credit card edge of plastic squeegee to rub over the mask, then attempt to separate again....OR...while separating, use an exacto or razor blade GENTLY placing it under the mask and lifting the edge off the backing, while continuing to pull the film and mask away. This scenario is not common, but, can happen. Normally, the mask will easily come off the backing, and still on the film. Now, your ready to place the mask in the desired area. LIGHTLY put the mask in place,being careful not to allow it to be pressed down...but rather JUST touching the surface. The adhesive used on the masks is "pressure sensitive", so, they should not be pressed down until you are SURE it is aligned properly. Once this is verified, then firmly press the mask down using either your fingers or a credit card/squeegee edge. Try to make your strokes go towards the tips of the flames for best results. 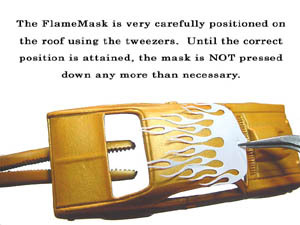 Now, at this point, you should inspect the area of your casting for hood, door, or body line creases in the area of the mask...if any of these intersect with the masks area, then you will want to use your fingernail or maybe the back edge of an exacto blade to push the mask into these creases so that any possible seepage of paint under the mask in these areas will be avoided. Once this is done, and the mask is completely pressed down, you can peel the application film away. Generally its best to peel from the front or larger part of the design to the tips of the flames. **** Ready for TOP Color?? I strongly suggest using thin coats of top color and only as much as it takes to completely "hide" the previous (or flame) color. 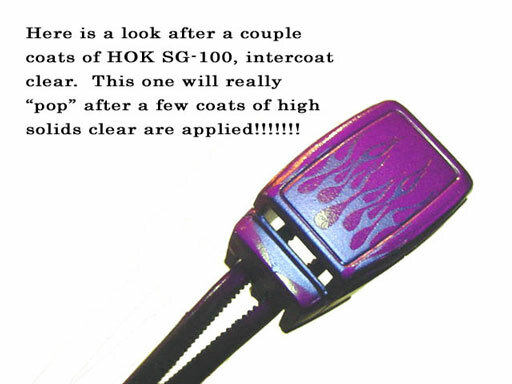 Excessive build up will create the need for more clearcoat to even the surface, can lead to to undesirable results (such as "jagged" edges and/or paint peeling) and will certainly shorten (or eliminate) the masks lifespan/reusability. Once the desired color and coverage has be achieved, allow a few minutes to dry so your freshly applied paint is at least "tacky", then CAREFULLY remove the mask by peeling from front to tips for best results. You may need to use the exacto blade or precision tweezers to get under the edge of the mask and pull it up, but, please use caution not to cut your mask or marr the paint. Its a good idea to let the paint dry before attempting to use the exacto to pull the mask edge up. Some masks may be able to have a excess portion of their material hanging of the edge of your casting, which makes it a lot easier to remove the mask, however, this may not always be the case. 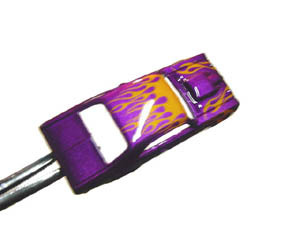 Now just clear coat as desired and you will have your own Flamed Kustom Diecast to enjoy! Also if you were careful removing the mask, you can now store it for another use!! Just reapply to the coated paper backing or wax paper so you can use it again!! Please note that although the adhesive will grip many times, sooner or later there will be a build up of paint on your mask that will give you a jagged or distorted edge...this should take at least two or more sessions, but, will depend greatly on how thickly the paint is sprayed over the mask to begin with. I DO NOT Recommend that you attempt to clean the paint off these masks at any time!! This could lead to damaging the mask or tiny debris from the wiping cloth becoming attached to the quickly drying paint on the mask and transferring to your next project upon reuse. You will need to use the OUTER MASK.